After spending years working as technicians at public schools, Jeff O’Hara and Nicolas Borg launched Edmodo in 2008 to address what they had come to see as a huge gap in the teacher-student relationship: The need for a better, safer way for teachers to connect and communicate with their students. However, with the launch of its APIs early last year to allow developers to build apps on top of its platform, what began as a social networking tool — a sort of Facebook or Yammer for education — has more recently evolved into a marketplace for education apps. Since then, Edmodo’s platform for third-party developers has grown to support more than 400 apps, tripling the growth of what is already one of the largest user bases in education, which today stands at over 18 million registered users. In an effort to help it further expand its growing app platform, Edmodo announced this week that it has made its first acquisition, scooping up Palo Alto-based educational app maker, Root-1 for an undisclosed sum. While both companies declined to share terms of the acqui-hire, Edmodo COO Crystal Hutter said that Root-1’s entire team will join Edmodo, with co-founders Manish Kothari and Ketan Kothari to help lead platform strategy and growth, while early Google employee, Vibhu Mittal, will lead R&D and co-founder Adam Stepinski will assume a “key role” within Edmodo’s engineering team. With the acquisition, Edmodo not only adds more technical talent to its staff of 70, but will now be able to leverage Root-1’s roster of five educational apps, including its OpenMinds platform, which allows teachers and students to turn learning content into apps. The startup developed OpenMinds to allow educators and educational developers to quickly convert their worksheets and projects, repurposing them into quizzes, flashcards, puzzles and games for mobile devices and the Web. Essentially, this allows technical teams to more easily access to content uploaded from third-parties so that they can devote more attention to design and infrastructure. On the teacher side, the critical value-add is that OpenMinds gives educators the ability to curate apps and educational content for the classroom and really to get more involved in how digital learning experiences are created and presented to students. As the EdTech space matures and tools like InBloom begin to make data more accessible and portable, Edmodo wants its platform to become part of the underlying fabric of digital education space. To do this, the startup aims to make itself an irreplaceable utility by becoming the marketplace and central distribution channel for classroom learning tools and content. Marketplaces like TeachersPayTeachers are thriving by providing teachers with access to a centralized marketplace where they can share and purchase lesson plans and other educational content. Of course, it also helps that TpT is helping teachers to make a pretty penny. The web has begun to provide teachers and students with an increasing variety of distribution and sharing channels for educational content, and, going forward, whoever positions themselves at the center of this exchange will find themselves in a powerful position. In this new digital educational marketplace, teachers will also be looking for better ways to channel the noise into signal and will need a way to tap into curated discovery and search for learning tools. Noodle could become this search and curation engine at some point, and eSpark Learning is looking to build better distribution, social discovery and payment solutions for education, along with giving students the ability to curate educational apps into custom learning profiles and playlists. While there are plenty of companies that harbor similar aspirations, with $47 million in the bank and 18 million registered users, no one can really hold a candle to Edmodo at this point, which has become one of the largest members of the new generation of EdTech startups. Admittedly, Edmodo’s monetization strategies are still largely incipient, but as the platform now offers hundreds of both free and paid apps (taking a percentage of the revenue from paid apps), that will begin to change. And with a network that’s 18 million-strong, Edmodo isn’t exactly in a hurry. 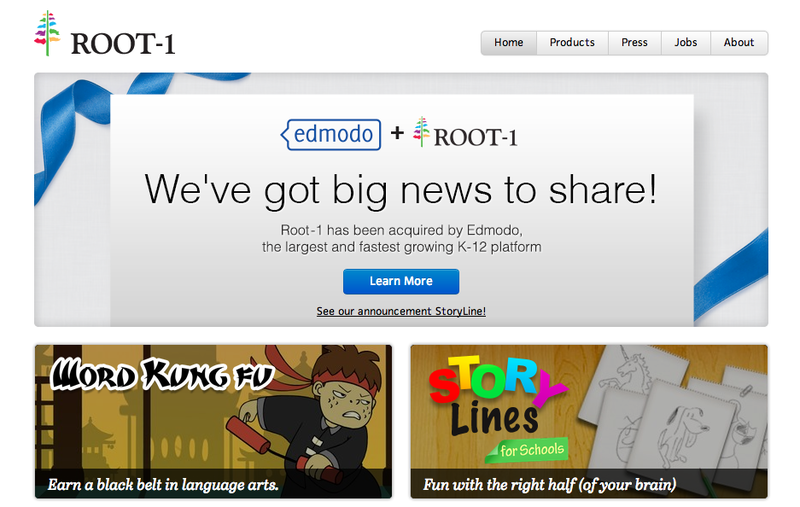 For more on the acquisition, find Edmodo’s blog post here.